A perfect dish to serve friends for a casual dinner. All you need to remember is to clean the mussels in advance. The best way is to scrub them with a small brush, then soak them in cold water with a teaspoon of salt for a couple of hours. In a large pot, sauté the shallots in 1 tablespoon of the butter for 1 to 2 minutes. Add 1 tablespoon of the parsley, the thyme, white wine, and pepper to taste, and bring to a boil. Add the mussels, cover, and cook, shaking the pot once in a while, until the mussels open (it will take about 5 minutes). Discard any unopened mussels. Remove the remaining mussels to soup bowls. Add the remaining butter to the pot. Stir until melted. Season with salt and pepper to taste. 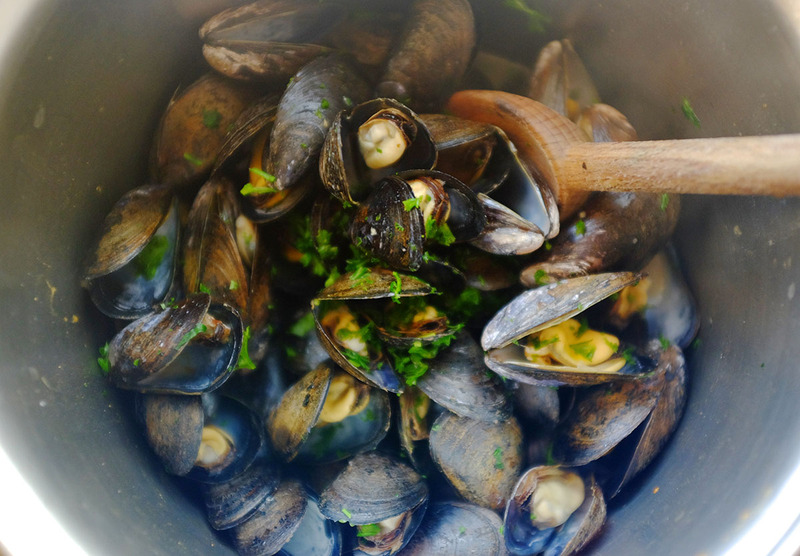 Pour the buttery juice over the mussels, and sprinkle with the remaining parsley. Serve with country bread to soak up any sauce, and have an empty bowl for collecting shells. Serve with the wine you used for cooking the mussels.